A tooth with deep decay is in real peril. If the disease isn’t stopped, it can eventually infect the bone and greatly increase the risk of losing the tooth. But tooth decay removal and a root canal treatment can stop advancing decay and resulting infection in its tracks. During this common procedure we first drill into the tooth to access the inner pulp. After removing the infected pulp tissue, we disinfect and fill the empty chamber and root canals with gutta percha. We then seal the tooth and crown it to protect against re-infection. 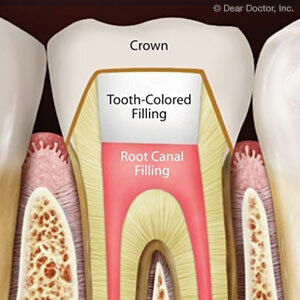 But while most root canals are successful and long-lasting, sometimes the tooth becomes re-infected. Here are 3 factors that could affect the long-term success of a root canal treatment. Early treatment. Like many health problems, the sooner we detect decay and treat it, the better the outcome. A tooth in which the infection has already advanced beyond the pulp is at greater risk for re-infection than one in which the infection is localized in the pulp. Keeping up your regular dental visits as well as seeing the dentist at the first sign of abnormality—spots on the teeth or pain—can increase your chances of early diagnosis. Tooth complications. Front teeth with their single roots and canals are much easier to access and treat than a back molar with an intricate root canal network. Root canals can also be extremely narrow making them easy to miss during treatment. In cases like this the expertise and advanced equipment of an endodontist (a specialist in root canal treatment) could help increase the odds of success in complex situations. The aging process. Teeth do wear over time and become more brittle, making them increasingly susceptible to fracture. A previous root canal treatment on an aging tooth might also increase the fracture risk. To avoid this, it’s important for the tooth to receive a crown after the procedure to protect the tooth not only from re-infection but undue stress during chewing. In some situations, we may also need to place a post with a bonded composite buildup within the tooth to give it extra support. Even if a tooth has these or similar complications, a root canal treatment may still be advisable. The benefits for preserving a decayed tooth often far outweigh the risks of re-infection.